ceeeb added a comment to T126782: AI gets stuck, and will not execute any commands, in some sequence..
ceeeb updated the task description for T85935: Script commands doMove and commandMove cannot reliably move AI units to some building positions. ceeeb added a comment to T120491: Bug Zafir RCO lying position. The players uniform is also a factor in repro of this bug. ceeeb added a comment to T126275: Rahim ammo incompatible with Rahim rifle bug in 1.72. It's a hangover from 2015. When introduced to the game, the Rahim was originally 7.62x51, then they changed it 7.62x54. ceeeb edited Additional Information on T126275: Rahim ammo incompatible with Rahim rifle bug in 1.72.
ceeeb edited Steps To Reproduce on T126275: Rahim ammo incompatible with Rahim rifle bug in 1.72.
ceeeb renamed T126275: Rahim ammo incompatible with Rahim rifle bug in 1.72 from Rahim ammo bug in 1.72 to Rahim ammo incompatible with Rahim rifle bug in 1.72.
ceeeb updated the task description for T126275: Rahim ammo incompatible with Rahim rifle bug in 1.72.
ceeeb created T126275: Rahim ammo incompatible with Rahim rifle bug in 1.72.
ceeeb updated the task description for T126274: Environment sounds are not blended when moving between different areas. ceeeb created T126274: Environment sounds are not blended when moving between different areas. ceeeb added a comment to T126258: The optical sight is jammed at maximum resolution..
ceeeb added a comment to T76947: Graphical glitch when you are looking trough RCO, ACRO or MRCO while moving crouched and using Zafir. ceeeb added a comment to T124222: The stance of waiting for a wounded soldier requires adjustment. ceeeb created T125840: Crash in 1.72.142164 stable due to 0xC0000005 - STATUS_ACCESS_VIOLATION. ceeeb created T125839: Status command menu (5) cannot be used without first selecting subordinate units. ceeeb updated the task description for T125704: Crash during VTOL showcase, stable build 1.70.141838.
ceeeb renamed T125704: Crash during VTOL showcase, stable build 1.70.141838 from Crash during VTOL showcase, stable build 1.70 to Crash during VTOL showcase, stable build 1.70.141838.
ceeeb created T125704: Crash during VTOL showcase, stable build 1.70.141838.
ceeeb renamed T120117: Fatigue/stamina cost of terrain slope depends on facing, not direction of movement. from Fatigue/stamina cost of terrain slope depends on direction of facing, not direction of movement. to Fatigue/stamina cost of terrain slope depends on facing, not direction of movement..
ceeeb added a comment to T120117: Fatigue/stamina cost of terrain slope depends on facing, not direction of movement..
ceeeb added a comment to T118766: (Apex) netfence_01_m_d_f.p3d AI cannot move through gaps in chain wire fence (cyclone fence) . ceeeb added a comment to T119929: The colour of many in game UI/HUD elements ignores the Active Elements setting. ceeeb added a comment to T72663: High command - commanded group symbols colour cannot be changed from white. 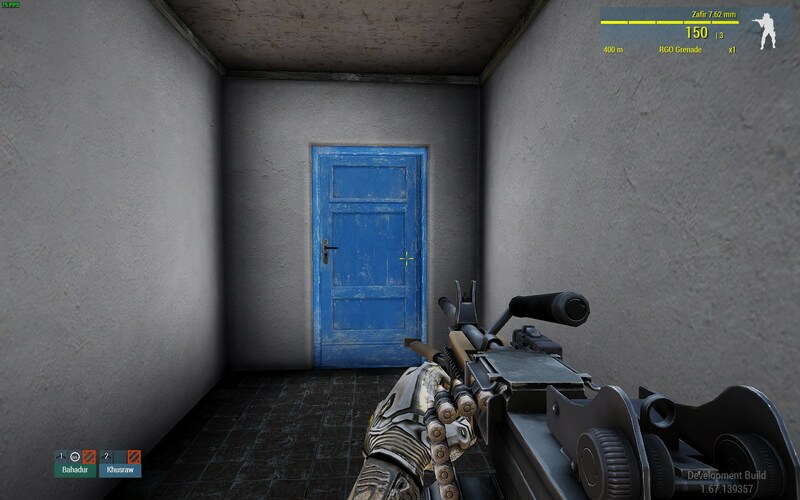 ceeeb added a comment to T85691: Deploying a weapon when prone near a building results in player under ground. ceeeb renamed T121342: FIXED: Tidal/coastal areas of all maps are covered in pattern of partial yellow squares from Tidal/coastal areas of all maps are covered in pattern of partial yellow squares to FIXED: Tidal/coastal areas of all maps are covered in pattern of partial yellow squares. ceeeb added a comment to T121342: FIXED: Tidal/coastal areas of all maps are covered in pattern of partial yellow squares. ceeeb added a comment to T76515: Group leader loses formation leadership when boarding an unarmed vehicle in cargo position. ceeeb renamed T118336: FIXED: (Apex) AI cannot enter fenced compound at Moddergat on Tanoa from (Apex) AI cannot enter fenced compound at Moddergat on Tanoa to FIXED: (Apex) AI cannot enter fenced compound at Moddergat on Tanoa. ceeeb added a comment to T118336: FIXED: (Apex) AI cannot enter fenced compound at Moddergat on Tanoa. ceeeb added a comment to T117762: (Apex) Dirt roads up volcano have no representation on satellite map . ceeeb added a comment to T62869: Walking (safe) produces too much head bob compared to eg. running. It appears when walking the camera is fixed on players head, whereas with the weapon raised its faked to the weapon. ceeeb added a comment to T59253: Contour lines are very difficult to see on the map. ceeeb added a comment to T58777: Can you allow to copy playable units?. Issue is resolved/fixed. Please close ticket. ceeeb added a comment to T64657: Add randomness to AI rate of fire. ceeeb added a comment to T124687: 1.70.141503 muzzle flash of jet got stuck. ceeeb renamed T76306: After loading a saved game, vehicles that have fired have stuck muzzle flash from After loading a saved game, vehicles that have fire have stuck muzzle flash to After loading a saved game, vehicles that have fired have stuck muzzle flash. ceeeb added a comment to T123238: 3FPS Issue "Call for Help" - Dump-gathering ticket. This is a long shot, but there is a bug with the skiptime command that can create very similar symptoms (2-3FPS which doesn't recover without restarting game) - T68952. The general 3FPS issue may somehow be related to use of skiptime command, and/or world time and weather synchronising across network? ceeeb added a comment to T123977: Some vegetation objects are transparent at some angles/LODs: Issue persists in stable v1.68. Why create a new issue to describe the same problem? ceeeb added a comment to T65976: Please readd commanding delay. ceeeb added a comment to T121844: Map texture for beach shallow water is corrupted. ceeeb added a comment to T121594: All units report "Ready" at start of mission starting cinematics of East Wind campaign. Issue is resolved in current RC build. Thanks. ceeeb created T121594: All units report "Ready" at start of mission starting cinematics of East Wind campaign. ceeeb added a comment to T84680: Scenarios from the steam workshop cannot be started when steam is in offline mode. I just encountered this issue in current stable build 1.64, when my connection to the internet failed. ceeeb added a comment to T121239: AI can suppress and fire precisely at target without any line of sight in some circumstances..
ceeeb added a comment to T82957: Enemy AI knows your exact position when you detonate explosives or satchel charges. ceeeb updated the task description for T82957: Enemy AI knows your exact position when you detonate explosives or satchel charges. ceeeb updated the task description for T121342: FIXED: Tidal/coastal areas of all maps are covered in pattern of partial yellow squares. ceeeb renamed T121342: FIXED: Tidal/coastal areas of all maps are covered in pattern of partial yellow squares from Map covered in faint yellow squares to Tidal/coastal areas of all maps are covered in pattern of partial yellow squares. ceeeb edited Additional Information on T121342: FIXED: Tidal/coastal areas of all maps are covered in pattern of partial yellow squares. ceeeb created T121342: FIXED: Tidal/coastal areas of all maps are covered in pattern of partial yellow squares. ceeeb updated the task description for T121239: AI can suppress and fire precisely at target without any line of sight in some circumstances..
ceeeb edited Steps To Reproduce on T121239: AI can suppress and fire precisely at target without any line of sight in some circumstances..
ceeeb renamed T121239: AI can suppress and fire precisely at target without any line of sight in some circumstances. from AI can suppress and fire precisely at target without line of sight in some circumstances. to AI can suppress and fire precisely at target without any line of sight in some circumstances..
ceeeb renamed T121239: AI can suppress and fire precisely at target without any line of sight in some circumstances. from AI can fire precisely at target without line of sight after hearing the target unit to AI can suppress and fire precisely at target without line of sight in some circumstances..
ceeeb created T121239: AI can suppress and fire precisely at target without any line of sight in some circumstances..
ceeeb added a comment to T117851: Unable to select any item in drop down item lists with mouse in Eden Editor. Duplicate of assigned T119921, but this report has much more detail and repro steps. ceeeb added a comment to T119921: Eden Editor triggering. ceeeb added a comment to T71576: AI continues firing salvo after a target has been eliminated [vehicles/infantry]. ceeeb added a comment to T81088: Get in Ride in Back and Get in as Passenger are reversed. What is correct? The original issue reported or duplicate status? ceeeb added a comment to T79880: Menu selection not matching destination seat in offroad truck. ceeeb added a comment to T79918: Offroad passenger side seat reads 'Get in Back' on Offroad menu UI. ceeeb edited Additional Information on T120726: Altis + Stratis vegetation and rocks not shown on map. ceeeb renamed T120726: Altis + Stratis vegetation and rocks not shown on map from Altis/Tanoa vegetation and rocks not shown on map to Altis + Stratis vegetation and rocks not shown on map. ceeeb created T120726: Altis + Stratis vegetation and rocks not shown on map. ceeeb added a comment to T76263: AI leader at guard waypoint will repeat attack command infinitely if his group is unable to attack the revealed target..
ceeeb added a comment to T120658: AI commander allways order to disembark after he take control over squad. ceeeb changed Category from category:general to category:weaponstabilization on T120637: Weapon control increases with high magnification weapon optics . ceeeb edited Additional Information on T120637: Weapon control increases with high magnification weapon optics . ceeeb created T120637: Weapon control increases with high magnification weapon optics . ceeeb added a comment to T65635: AI gitches : go through certain building in Agia Marina. YT videos are private, not much help if ppl can't watch them. ceeeb added a comment to T120566: Prone bug [URGENT]. Confirmed in dev 1.65.138805, although the turn angle needs to be more than approx 30° for the bug to occur. ceeeb renamed T120550: AI get stuck walking in circles forever if trying to move to building position which is under terrain surface. from AI get stuck if trying to move to building position which is under ground surface. to AI get stuck walking in circles forever if trying to move to building position which is under terrain surface..
ceeeb created T120550: AI get stuck walking in circles forever if trying to move to building position which is under terrain surface..
ceeeb added a comment to T62763: Wheels collision provides weird results. Unable to reproduce in 1.65.138.598.
ceeeb added a comment to T62293: Blood has tube-like graphical error. Issue persists in dev build 1.65.138598. It seems to be less frequent than before, but I am using a new PC so cannot be sure. ceeeb added a comment to T59472: Inability to pick up back packs. Repro B is still an issue in my brief MP test in dev build 1.65.138598.
ceeeb added a comment to T61547: Scoped optics doesn't reset to front while you are resting your weapon and in a crouched position. Issue is resolved. Please close. ceeeb added a comment to T60575: Pistol crouch silent and increases movement speed. ceeeb added a comment to T59848: Throwing genade into water no visual splash or sound of entering water- no water effects when goes off. Explosion effects are present in 1.65+, but still no water entry splash sound or effects. ceeeb added a comment to T59277: Grenade throwing is unrealistic (too fast). ceeeb renamed T120474: Units can clip through the side of concrete footing (floor) of object supermarket_01_f.p3d from Units can clip through the concrete footing (floor) of object supermarket_01_f.p3d to Units can clip through the side of concrete footing (floor) of object supermarket_01_f.p3d. ceeeb edited Steps To Reproduce on T120474: Units can clip through the side of concrete footing (floor) of object supermarket_01_f.p3d. ceeeb edited Additional Information on T120474: Units can clip through the side of concrete footing (floor) of object supermarket_01_f.p3d. ceeeb created T120474: Units can clip through the side of concrete footing (floor) of object supermarket_01_f.p3d.